Paul and Phil are back behind the mics once again this week and as has been the trend in recent weeks the lads are flying solo. Today Phil looks at his pre=publishing checklist as he talks about the 13 things he does before he publishes any blog post. So many bloggers will write, edit, proofread and then publish. Phil, on the other hand, another 13 steps he follows to make sure that his content packs a punch and really has the best chance of making an impact with his audience. Do you want to see behind the scenes of this very Podcast recording? Then check out the Daily Vlog more specifically Episode 62, where you can see the lads record this very episode. 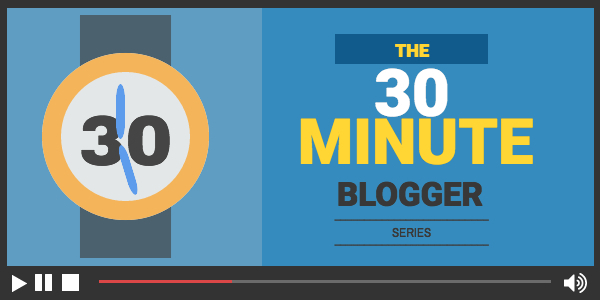 We know that everyone is tight on time when it comes to blogging, that’s why we’ve developed the #30minblogger series. The 30-minute blogger is designed to give you actionable, practical advice that you can implement in less than 30 minutes, so if you’re looking to save time and increase traffic to your blog leave your name and email address below and we’ll show you how! Learn to make the most of your blog in just 30 minutes a day!